Twenty-eight Days until MS Awareness Month! Because my symptoms since diagnosis have reacted fiercely to heat, I have questioned those Warriors who complained of low temps raring up the beast. Well...I sure got the shock of my life this week. Of course all over the US the mercury has hit record lows since Monday, but never did I ever expect the effect that would have on little ol' me. Sunday, January 27, my little family traveled to Pittsburgh for an overnight campus visit at Carnegie Melon University for our son. After an afternoon of orientation sessions and a frigidly cold campus tour, he sent off with a veteran student for the evening and hubby and I headed toward our hotel. That was the plan and it worked fairly well. Back up to that campus tour. "walking tour. In below zero wind chill factor winds. The campus is not that big. it is very intimate, the perfect size in my opinion. Although located smack dab in the middle of the city, CMU is a little village of its own. This should have been a cinch for me...the tour that is. Well...it was not. Minutes into the event, my feet decided they didn't want to go with the rest of me. They were frozen. My knees forgot they were part of my body. As I watched my son, husband and thirty other people traverse the campus, I pretended to be interested in the sidewalk design as I found myself an audience of my own informational tour. Having fallen back so far there was no way to hear the guide's words and, in fact, often not even in the same vicinity, I slowly (and painfully) trailed behind. Finally my husband realized my struggle and suggested we sit out the last portion of the tour and return to the warmth of the origin of our tour. I really wanted to experience this with my son and hoped he understood the predicament. He understood and filled us with a colorful description of what we had missed; so, all was good. My point in telling this story is that I learned something new about my disease. Warriors need not to pick a side where weather temps are concerned. Evidently any severity in climate adversely affects the nerve endings that control our reaction to multiple sclerosis. So, my new strategy for coping with winter: Stay inside. A no-brain-er, right? It is twenty-eight more days until MS Awareness Month! Why am I celebrating this recognition of such a MonSter? Why do I sound excited? March is the month that I can give back to NMSS and fellow Warriors. I can no longer participate in MS walks by placing one foot in front of the other, but I CAN raise money through selling my book I Have MS. What's Your Super Power? I pay postage, sign the book, and maybe include a little something extra during the month of March. Just shoot me a check for $13.00 with your mailing address and i will get right on it! Also during March, I post a blog every single day. This year I am living outside my comfort zone and inviting you to be more active in this. I would love to interview fellow MS Warriors and post your story right here. Please message me here or via e-mail if you are interested and we will make that happen. 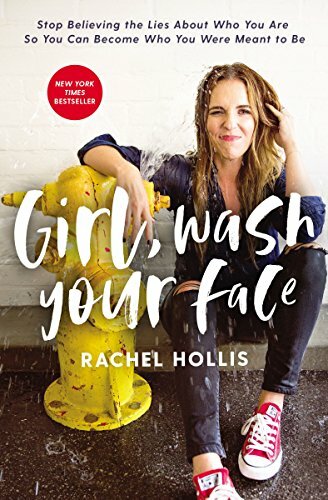 Although Rachel Hollis does not have multiple sclerosis, she is wildly enthusiastic about being positive in life. Plus, she gave me an excuse to treat myself to a pair of Converse. 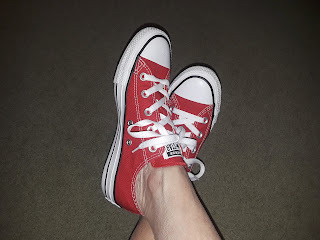 I've never owned a pair and what better reason is there to add red shoes to my wardrobe? So, here is a dual challenge for you. Read Girl, Wash Your Face with me and treat yourself with something you normally wouldn't consider. You are worth it! 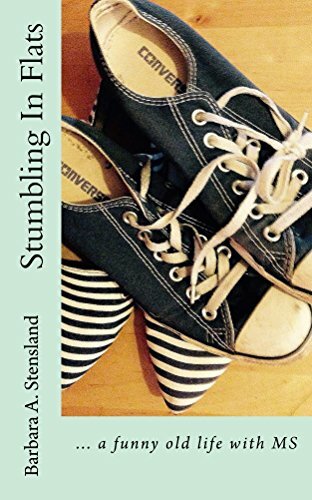 ...and, oh, yes, Barbara Stensland also seems to have a "thing" for converse sneakers. Maybe we can deem them the official shoe of Warriors? Everyone wants to play, learn, have friends, and be included. The COUNT ME IN puppet program helps children understand that people with disabilities are much like they are. This age-appropriate introduction to disability awareness and inclusion is for grades 1 to 4 with a shorter preschool/kindergarten program. The cast includes Gina, who is blind and uses a cane; Jay, who is deaf or hard of hearing; Sally, who has a physical disability and uses a wheelchair; and their friends, Carmen and Mitch. Following the puppet show, attendees will be given the opportunity to "try on" MS with supplied leg weights, vision impaired eye ware, and other disability props. I will then read from my award winning I Have MS. What's Your Super Power? and entertain questions/discussion. Oh, and let's not forget the yummy treats that will be provided! This is going to be a wonderful prologue to M Awareness Month and I am so very grateful to the library and Connie VanGilder, the library program coordinator, for making this possible. I have a couple of other venues up my sleeve, but they are not confirmed. Help me fill up March! 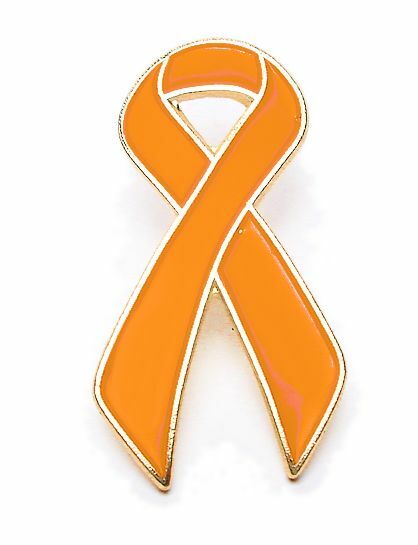 Twenty-eight days until MS Awareness Month! Until then...stay warm, read a book, be strong (because you are), and be positive. In a soup pot, sauté some Italian sausage out of its casing, then add onions, carrots, celery, garlic, whatevs. Maybe a smidge of apple cider vinegar if you feel like deglazing, but does anyone actually do that? Add roasted squash, a handful of fresh sage, several cups of stock, and a glug of maple syrup (obvi the real stuff, I hate winter, I don’t hate Canada). Bring to a boil, then simmer until you feel like it. Rachel Hollis, look what you started.